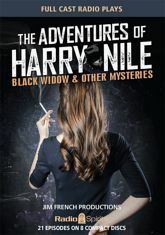 From the imaginative radio mind of writer/producer Jim French comes the tough-but-thoughtful private eye who roams the rain-swept streets of the Pacific Coast in search of crime, adventure, and enough dough to keep the office lights on for another month -- Harry Nile! It's new radio drama produced in the classic style, with stories set in the golden age of private-eye drama. Phil Harper stars as Harry in high-powered, hard-luck radio adventures! The twenty one episodes featured here include the last show of the character's 1970's run, and the first twenty episodes of his glorious return in 1990.